Alaric and his Goths have moved to the East of the empire where they are fighting the Eastern Romans in a border dispute. This has removed the immediate danger of barbarian attack on Rome itself. Southern Gaul has been overrun by barbarians and is now out of Rome’s control. Britain, northern Gaul and Spain owe allegiance to a rebel emperor called Constantine the third. The situation then was far from satisfactory but there was no immediate danger. Italy was not directly threatened and the grain supply from Africa was secure. So the court could indulge itself in intriguing and politicking. One might have thought that the one man who would be immune from this would be the imperial father in law and saviour of the nation, Stilicho. After all, who else was capable of holding back the attacks and maybe restoring some kind of order to the empire’s borders? But the resentment of the court against him was deep rooted, and seems to have been genuine hatred originating from Honorius himself. I suppose having your authority usurped is hard for anyone. And the scale of authority undermining in this case deserves some kind of award. 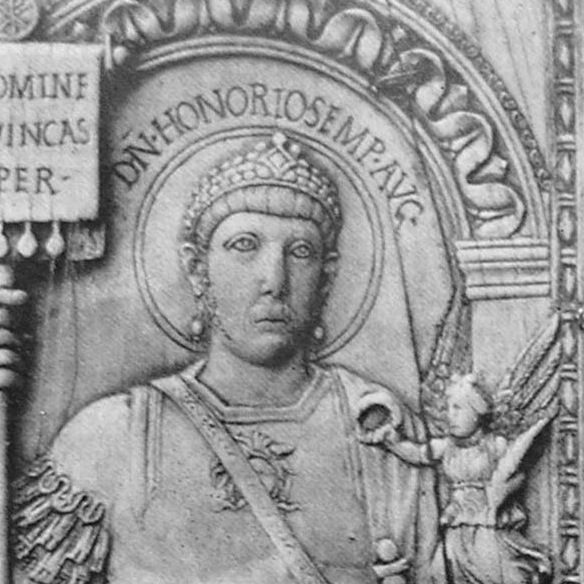 Honorius had had to be rescued because of his own stupidity. The man doing the rescuing was his father in law who then went on to become a public hero. That has got to hurt. It is always good to have an effective emperor on the throne. But the system could work well enough if the emperor simply delegated his functions to people who knew what they were doing. And this was the case while Stilicho was in charge in all but name. When Honorius killed him, the imperial policies became increasingly erratic, confused and in almost every case disastrous to the empire. Whether these arose directly from the stupidity of the man himself, or from the people around him scarcely matters. There does seem to be a consistent paranoid thread to them which sort of indicates that ultimately Honorius himself was not just a figurehead, but actually contributed to the situation. To start things off, the first edict was to ensure everyone who was not strictly orthodox was excluded from the government. This had the obvious effect of reducing the pool of talent from which to select officials, generals etc. Roman society was hardly a meritocracy at the best of times, but to exclude someone on these grounds during a crisis seems particularly dozy. But failure to get the best people on board pails into insignificance compared to the next decision. There were still large numbers of foreign auxilary troops on the books. They had been recruited by Stilicho and were presumed to be and probably were faithful to him rather than the emperor. They hadn’t caused any trouble. This was no doubt because their wives and families were being housed in Italy. Any move on their part detrimental to the interests of the empire could instantly lead to reprisals against their defenceless dependents. Incredibly, the order went out from the court for the wives and families of Stilicho’s troops to be massacred. Not the troops themselves. This was a monstrous and inhuman act that turns the stomach. But it was also extremely stupid. This petty but barbaric order instantly transferred these troops to Alaric’s side. We are talking here about 30,000 active, trained and experienced fighting men who now had a deep personal grudge towards the emperor Honorius and his empire. Within months of the death of Stilicho, Alaric was laying siege to Rome with these 30,000 auxilaries amongst his forces. I imagine they were pretty motivated. Because with Stilicho out of the way Alaric was soon back. He sent complaints about an unpaid subsidy and made it clear that he would be arriving in person to address the matter. He was now able to claim to have been the friend and the respecter of Stilicho, portraying himself as a righter of wrongs and the true representative of martial Roman virtue. It was cheeky, but it had an element of truth about it. His reputation was higher than ever so he could probably lead more men than he had had before. And there was nobody able to organise any opposition. He could move into Italy at will, which was exactly what he did. On arrival he made contact with the disaffected units whose families had been killed, swelling his ranks still further. Aquileia was the first city of northern Italy to be sacked. It wasn’t the last. He marched to the edge of Ravenna, but realised that the defences were simply too strong for even his large army to penetrate. He pulled away and marched south towards Rome. On the way he encountered a holy hermit who had taken up residence in a swamp. The hermit denounced Alaric to his face, which might have been taken as a bad sign by his largely Christian followers. But Alaric replied that he felt impelled by a divine compulsion to march on Rome. He seems to have been convincing and the march continued. The Goths had command of the countryside. At Mevania they came across the flock of pure white oxen that were bred and kept exclusively for ceremonies in Rome, back in the days when emperors might have victories that warranted a triumphant progress through the city. The Goths ate them. Soon the army was camped outside Rome, and Alaric found himself up against the walls of the mistress of the world – the very position that he had tried to reach and been frustrated by the now dead Stilicho. It was a very different city to the one that Hannibal had threatened some six hundred years before. Then, even though the Romans had 100,000 troops stationed overseas they could still muster an army of nearly the same number just from the city and its surrounding districts. Not only was there no talk of pulling forces back to Rome, even with Hannibal on his way they found enough spare men to send some away as reinforcements for Spain. Rome was invincible not because of its walls but because of the number of fighting men it had available. In the previous crisis Stilicho had found raising forces to be very difficult. This time nobody in authority even tried. The lack of military knowledge of the imperial entourage is almost painful. 5,000 troops were sent out from Ravenna to relieve Rome. They would not have had a chance had they arrived, but they didn’t even get that far. They were eliminated en route by the barbarians in the countryside. I wonder how different it would have been if the 30,000 troops forced into Alaric’s camp had still been available. The inhabitants of the city were forced to negotiate directly with Alaric, who offered them stark terms. They had to hand over everything. When asked what he would give in return, the reply was their lives. They threatened to emerge en masse and drive him off. His reply was that the thicker the grass was planted, the easier it was to mow. Despite the recent revival of the Senate, there was a distinct lack of leadership available in the city. The lofty lineages of the republic were long gone. Rome was now not so much full of chancers, as full of the comfortable descendants of chancers. The Anicians were acknowledged as the leading family. Their pre-eminence only went back to the time of Constantine when they had become the first family to convert to Christianity. Since then they had held lots of offices and had lots of clients. They didn’t produce somebody equal to the hour, and in fact they were probably something of a dead weight since it would have been difficult to do anything without their support. Rome had lost any control of its fate.